. The Age of Tropheus by Ad Konings. Determining when they first appeared. The Children-Eating Ogres from Lake Malawi by Patrick Tawil. 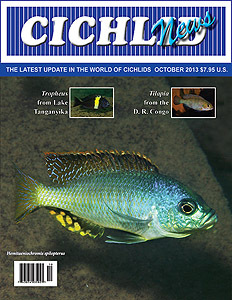 Paedophagous cichlids from Lake Malawi. Aquarium Husbandry of Tilapia ruweti by Paul Loiselle. A small Tilapiine back in the hobby again. Identity of ‘Heros’ urophthalmus & festae by Willem Heijns. Their biology and how to tell them apart. Keeping the Panda Uaru by Radek Bednarczuk. Tips on their husbandry. My Favorite 6 Cichlids by Greg Steeves. The Victorian specialist shares his favorites.